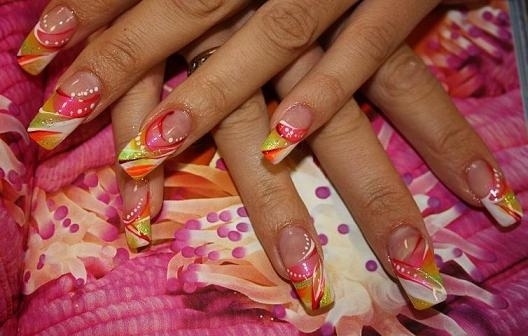 Fun and Colorful Nail Art Designs. 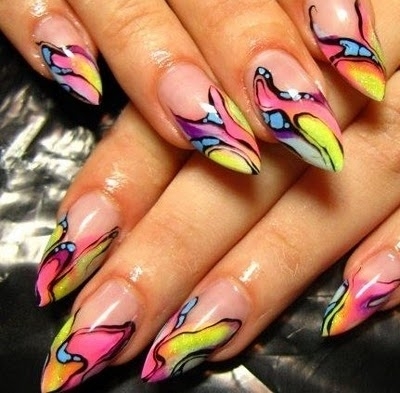 It is absolutely amazing how much a fun and colored nail art design can transform the aspect of your hands, so get your nails prepped for the new season if you want to look hot. Well manicured nails are always a focus point, therefore, experiment with different nail art designs and everyone will observe your interest for style! The endless nail polish colors developed offer you the possibility to create a myriad of nail polish color combinations, for an abundance of fun and colorful nail art designs. 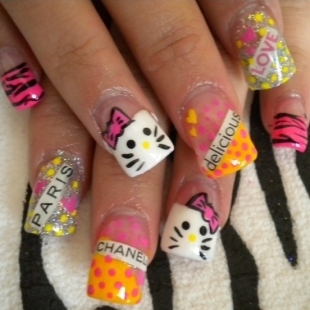 It is absolutely amazing what you can do with the right nail products and a little bit of skill, so select your favorite nail varnish hues and create cute and fun nail art designs which suit your personality as well as the new season. Color can instantly brighten-up your look, and this applies to everything from fashion to nails and home decorations, so no wonder people love to play around with various hues. Colors make our lives more fun, so boost the natural beauty of your hands and nails using colorful nail art. Start with easy designs and work your way to sophisticated ones, as perfection does matter in this case. 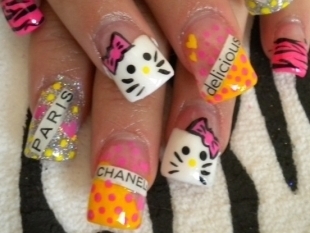 The more you practice, the better you'll get at doing your own nails. 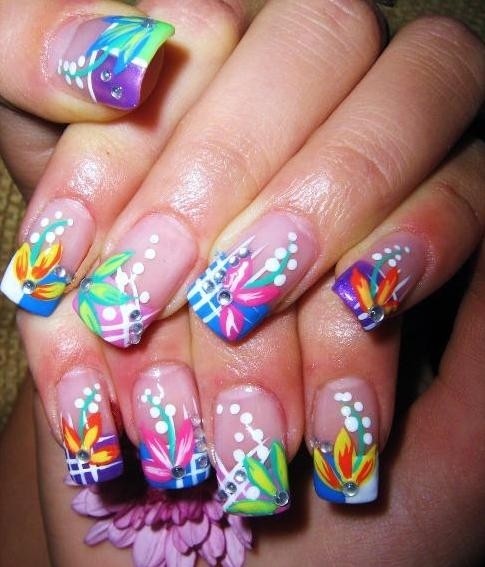 Because there are a myriad of nail varnish hues and nail polish designs out there, we have put together some cute and flirty colorful nail art design ideas which can definitely inspire you. Colored nail polish and polka dots are definitely a cute and easy to create combo that will make your nails look absolutely adorable. Use your favorite nail polish hues to create an abstract, multi-colored nail polish design and cute dots to add a bit of sophistication to the design. 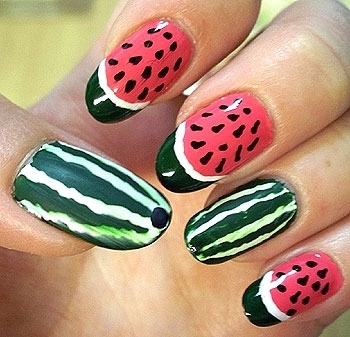 Apply the polka dots using a toothpick or a special nail art dotting tool. 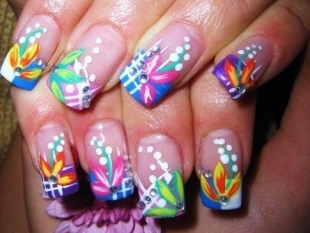 You can apply the dots as your desire, either way they look absolutely lovely. 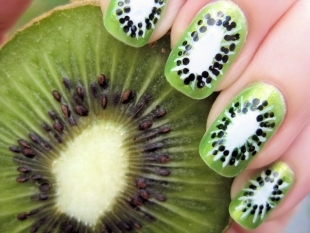 Apply a top coat to enable the colors to have a glossy finish that will also help your nail art last longer. 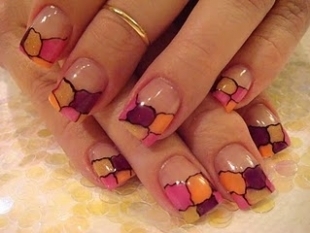 Abstract nail designs are the easiest designs to create and there are a variety of styles to opt for. Apply dots of your favorite nail polish hues relatively close to one another and then use a toothpick or a special nail art tool to spread and blend the hues until you obtain the pattern that you love. Use a thin nail art brush to trace the outline of the colors and enhance the style of the design, using a different, contrasting nail polish hue. 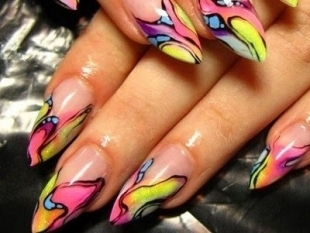 Go for neon shades, glitter as well as nail art stickers to show your creativity! 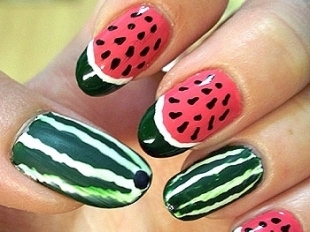 Fruits are not only delicious, but they are also fun especially if they are drawn on your nails. The results are absolutely adorable and mouthwatering also, in consequence they are a magnet when it comes to attention. 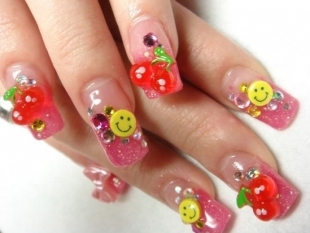 Perfect for causal occasions, these nail art designs can really bring a smile on your and everyone else's face. 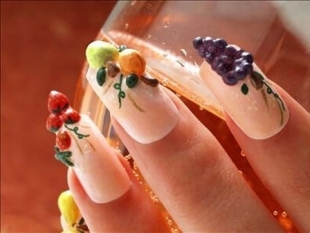 Create your own fruity nail art design using nail varnish or use acrylic details or stickers for your design, either way your fruity nails will look gorgeous.